Horns: F Robson, E Powell, W Duckworth, A Gupta, O Holmes. in the studio, which they performed to the school in assembly in May for the last time together in this current line-up, as old members leave and new ones arrive. – Piano/Alto Saxophone, J Pickles – Drums, E Powell – Trumpet. E Anderson – Lead Guitar, J Fitzsimons – Vocals/Piano, R Forrest – Bass, T Gawthorpe – Rhythm Guitar/Vocals, B Strode – Vocals/Piano, C Sturdy – Drums, R Wheatley, B Wood – Rhythm Guitar. Repertoire: Shut Up and Dance, Rolling In The Deep, Summer Of 69, Radioactive, Boulevard Of Broken Dreams, Use Somebody, Eye Of The Tiger, Don’t Look Back In Anger, Beat It, Seven-Nation Army, Johnny B. Goode. of Wizard’s I Wish It Could Be Christmas Everyday in the Christmas assembly. Other notable performances came at the Hull Disability Games, held at Hymers, as well as the annual Comedy Night, where Oliver Hatfield and Peace Umudjoro gave acoustic solo performances before the band set. 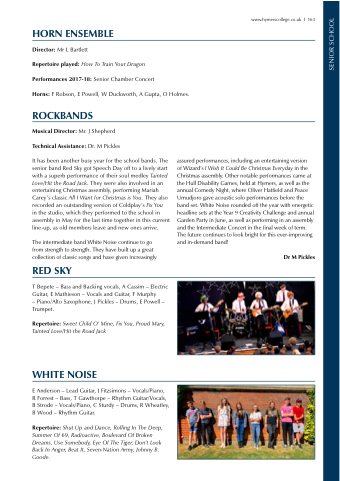 White Noise rounded off the year with energetic headline sets at the Year 9 Creativity Challenge and annual Garden Party in June, as well as performing in an assembly and the Intermediate Concert in the final week of term. The future continues to look bright for this ever-improving and in-demand band!